Assiniboine poplar is a tall, fast growing tree that has a shapely oval form and dense foliage. 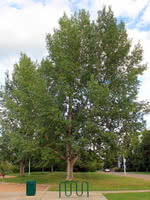 This hybrid poplar is a male clone and produces no fuzz or fluff. Assiniboine poplar can handle tough conditions such as: urban pollution, environmental salt, drought, poor soil, and even some standing water. The Black Walnut is a slow growing, large, straight-stemmed tree with an open crown. It produces dense, very hard, edible nuts. Black Walnut has a deeply-furrowed, black bark. Its leaves are about 1 foot long, composed of 15 - 23 slightly stalked leaflets on a moderately stout stock which provide good dappled shade. Despite being highly valued for its edible nuts and its shade tree aesthetics, it is rare to see this tree on the prairies. Note: Black Walnut's roots produce a substance named juglone that is toxic to some other plants. Consider this when choosing where you plant a black walnut, as you will not be able to grow tomato, potato, cabbage, eggplant, blueberry, azalea, rhododendron, lilac, red pine and apple in the surrounding area. Note: plant this tree once. It will not respond well to transplanting. Note: Although self-pollinating, planting two trees significantly improves nut production.